libcom editorial note: Beatrice Reubens had worked on Far Eastern affairs in the Department of State. She also served as a member of the Secretariat of the eleven-nation Far Eastern Commission, and during the war was an economic analyst with the Office of Strategic Services. The article was written contemporarily to the industrial action and we can assume it was intended for consumption by US strategists. However, there is a dearth of online material about Japan's workers movement, especially during the first years of the US occupation, so we reproduce the article without endorsing the analysis. While the article is clearly concerned with mechanisms to prevent production control from threatening property relations, the admission that it does shows how seriously the US occupation and Japanese government took the issue. The current wave of strikes in Japan, aimed in part to effect the resignation of the Yoshida cabinet, is a major political move on the part of the newly organized Japanese labor movement. The strength of the present strike action indicates the remarkable progress made by labor in the first year of the Allied occupation and the extent to which unionism has spread after years of suppression by the Japanese government. 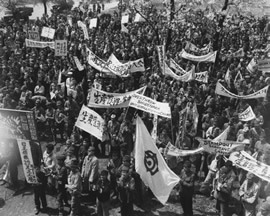 The Allied directive of last year which established the right to organize and bargain collectively resulted in the rapid growth of the infant labor movement in Japan, and novel tactics were utilized by the new unions. The technique of "production control," al though not the most typical method of bargaining, is significant because it challenges the traditional concepts of industrial relations and the institution of private property. It has caused difficult legal problems for the Japanese government and has placed further strain on the relations between General MacArthur and the Soviet representative on the Allied Council for Japan. establishment. While the owners were considering the union demands or carrying on negotiations for a set tlement, the workers continued to produce, buy and sell, without permitting company officials either voice in the enterprise or access to the premises. After settlement, usually with a full victory for the workers, the plant was turned back to the management. time, entails no interruption of production, and is settled amicably by negotiation. The conditions which have encouraged the adoption of production control as a bargaining instrument arise out of the defeat and the occupation. So revolutionary is the freedom labor enjoys and so drastic are its demands for wage increases to meet skyrocketing prices that adoption of a flamboyant method in pursuing these aims is scarcely surprising. With the Japanese economy severely disorganized and many employers closing factories because they are uncertain of their ability to continue production, union leaders have hesitated to incur the ill-will of the goods hungry public by conducting strikes. In many cases workers have resorted to production control as a means of maintaining employment when employers were about to cease operations. Since employers were accused of closing up because they preferred speculative dealing in raw materials to current production, the workers could keep their jobs only by taking over the operation of the plant. industries are virtually forbidden. The workers, therefore, have welcomed a substitute weapon like production control. singled out individuals for punishment, so organized labor, with its marked political bent, has attempted to dispossess industrialists on the ground that they aided in or profited from the war. The firstcase of production control, that of the Yomiuri Hochi, a Tokyo newspaper, was designed to change the editorial direction and policy of the paper rather than to avoid an interruption of production. The program of democratization which SCAP introduced has been interpreted as justification for production control. According to some Japanese theorists, the new freedom implies the end of every institution of the old order, including the rights of private property. As one Japanese lawyer put it, "Though a bad law is still a law in normal times, a bad law is, in my opinion, not a law in such a revolutionary age. . . ,"The recent passage of the Trade Union Law which established the legal right to strike also seems to establish the automatic legality of production control, as many Japanese consider the latter less harmful to their devastated society than a strike. can be accomplished only by passing through such stages as labor control of production. . . ." This attitude has not been general, however, and no reports appeared that labor is reluctant to surrender a plant to management once a dispute is settled. A wide variety of industries has been affected by production control, including newspapers and shoe manufacturing concerns, Red Cross hospitals and coal mines, municipal government offices and steel works. The technique has been particularly popular in the Tokyo area and in the coal mines of Hokkaido and Kyushu. Production control has been most successful where the company's product or service was distributed directly to the public and where the dispute was settled fairly rapidly. Prolonged periods of produc? tion control or drastic reactions from employers raised insoluble problems of obtaining raw materials, markets and credit. For example, as soon as production control began in one manufacturing company which produced truck parts, the management withdrew all materials and gave them to a sub-contractor to finish. The parent factory was under production control but, as there was nothing to produce, the workers* action failed. Workers have been somewhat cavalier in their treatment of the person and property of their employers. One employer who refused to surrender the keys to his plant was locked up in his office for four days. Such acts as forcing employers to hold interviews, trespassing or seizing residences, and making unau- thorized searches for commodity hoards have been regarded as "minor offenses" which the police condoned until recently. One of the few cases regarded as extreme involved striking coal miners in Hokkaido who not only took over the Mitsubishi mines but con- stituted themselves a "People's Court" to try their employers and top company officials as war criminals. While production control is in effect, wages are set at the greatly increased rates demanded by the workers and are paid out of the business receipts whether from streetcar fares, the sale of finished products, or the disposition of raw materials. with the Takahagi mines if seized by the workers. The Nippon Coal Company asked the Coal Board of the Ministry of Commerce for its view. As a result of the conference, the president of the Nippon Coal Company wired the eleven branches of the company on March 25 that "control of production by workers is illegal.". The director of the Coal Board, hastening to repudiate this statement, claimed he had only indicated that, if workers controlled production, the proceeds from the sale of coal delivered by workers should be paid to the company. The Board also said that mineowners need not pay more than ordinary wages and allowances to the workers when production control was undertaken. that wages as well as the expenses of management would be paid by the company during the dispute. (7) The union opposed this statement bitterly as it felt that it could not carry out production control unless it had jurisdiction over the company finances. In sympathy with the Takahagi union, the nationwide Federation of Miners' unions threatened a sympathy strike in which all mines would be taken over by the workers. Six thousand representatives of over thirty unions held a protest meeting on April 12 before the ministries of Commerce and Transportation. According to a report in the Yomiuri Hochi, a newspaper entirely sympathetic to the workers, the demonstrators, with sticks in hand, forced the police cordon to withdraw and then waited for the return of the Minister of Commerce. The determined union men succeeded in seeing the Minister of Commerce a few hours later and he made a major concession. He removed the government from the picture by stating that, until the legality of production control was formally decided, the question of who was to receive the money from the sale of coal might be freely determined by the two parties concerned. On April 15, the allocating agency and the union reached an agreement which provided that a union which had mines under its control would receive full payment for coal it turned in. The union then settled back to the real business of negotiating with the company for the acceptance of the union's original demands. The substantial victory achieved by the Takahagi miners in their efforts to establish the right to take over control of production reflected the weakness of employers and the uncertainty of the government rather than general acceptance of the new labor tactic. The Shidehara Cabinet had struggled with the problem of the legality of production control since January 1946 when the technique firstgained promi- nence. Aroused by reports of violence and intimida tion attending production control cases, four ministers of the Shidehara cabinet issued a statement on February 1 which reaffirmed the government's belief in the free development of trade unions but warned against illegal acts, such as threats, violence, and infringement of property rights. only in curbing illegal acts connected with production control and not in deciding the legality of production control itself. tiated a restriction on mass demonstrations. Japanese government took the occasion to speak out against production control as well. Japanese respect for pronouncements of the premier or cabinet that most people considered the issue settled. The weakness of the legislative and judicial branches of the Japanese government had always in effect established the executive's actions as law. Only a few realized that the Diet would have to pass a law which SCAP must approve and that the question could be taken to the courts after a law was enacted. cases of production control continued to increase. The first democratically elected government in in Tokyo, the Soviet delegate, General Derevyanko, Japan took office in May. At his firstpress conference, submitted a list of twenty-two recommendations on labor legislation to General MacArthur. Among the Russian proposals was one which would permit workers to take over any enterprise that closed without paying dismissal allowances to its employees. George Atcheson, representing General MacArthur, attacked the Soviet proposals. In particular, the Soviet sugges? tion regarding production control was sharply criticized by SCAP which, heretofore, in keeping with its labor policy, had been strictly neutral on the issue. The SCAP statement said: "This measure of pre- emption and practical confiscation of property without due recompense violates the law of property rights providing for due compensation for seizure of property. So far as is known, no such provision exists inany nation of the world. Even in the Soviet Union it is believed most doubtful that such measures are provided for or permitted." although government officials tend to treat it as an illegal weapon. No longer a novelty, production control does not receive the publicity of its early days but the number of cases in July, when the SCAP repudiation occurred, was larger than in June. The immediate problems created by the present strikes are so much more serious than those raised by production control that an ultimate test on the latter will probably be delayed. Profit-sharing has gained favor as a means of giving labor more interest and responsibility in industry. In the long run, these indirect results of production control are likely to be more important than the unorthodox technique of enforcing demands.